Breitling's limited edition Navitimer Cosmonaute evokes the first wristwatch worn by a NASA astronaut in space. Swiss watchmaker Breitling is offering a new timepiece to celebrate the 50th anniversary of its watches' first launch into space, which was also the first time an American astronaut wore a wristwatch into orbit. The newly issued Breitling Navitimer Cosmonaute borrows some features from the chronograph that astronaut Scott Carpenter wore on NASA's Mercury-Atlas 7 mission, a historic watch has been missing for the half-century since Carpenter set the record as the second American to circle the Earth. Carpenter, one of NASA's original seven astronauts, lifted off on May 24, 1962. Flying aboard Aurora 7, the name he gave to his Mercury capsule, Carpenter orbited the planet three times on NASA's first manned mission focused on science. Recognizing that his tasks in space would involve timekeeping, and having been introduced to the Navitimer as a trusted watch used by pilots, Carpenter approached Breitling to produce a modified version of the timepiece for his orbital flight. The astronaut suggested Breitling keep the Navitimer's unique circular slide rule for making flight calculations but replace its tachymeter dial with a 24-hour display. "Nowhere on a 12-hour dial does it say '8 p.m.,'" he said. Ultimately, NASA adopted a watch without a 24 hour dial, the Omega Speedmaster, but Carpenter's original Breitling gave way to a new version of the Navitimer, named the "Cosmonaute," of which the 50th anniversary edition is the latest model. The watch that started it all however, has become history itself. Almost five hours after embarking on the fourth manned U.S. spaceflight — the second to enter orbit — Carpenter's Aurora 7 spacecraft splashed down in the Pacific Ocean. Due to a targeting mishap, the capsule landed about 250 miles (400 kilometers) off course. In the process of his delayed recovery, once outside the spacecraft, Carpenter — still wearing his Navitimer — was submerged in the ocean. The watch was less than water tight, so Carpenter returned the timepiece to Breitling for repair soon after the mission. Rather than repair and return the space-launched watch, Breitling instead presented Carpenter with a new Navitimer Cosmonaute, the production model he had inspired. At the time, the watchmaker probably thought it was a generous gesture, and Carpenter appreciated the new timepiece. Today, the first watch flown on a U.S. crewed spaceflight would be very valuable, if not priceless. The only known photographs of it were captured by happenstance, when NASA photographers caught the watch in pre-flight shots as Carpenter strapped into Aurora 7 for his history-making flight. To this day, it's unknown what became of the watch that orbited the Earth. Breitling has searched through its vaults to no avail. 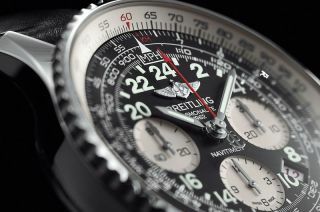 Breitling launched the 50th anniversary "Scott Carpenter" edition of the Navitimer Cosmonaute on May 24, 2012 at astronaut- and cosmonaut-studded events held in Miami, New York City and Houston. Carpenter himself was present at the Big Apple event as part of several anniversary celebrations that also reunited him with his mission's recovery ship, the U.S.S. Intrepid aircraft carrier, which is now a Manhattan-based sea, air and space museum. The anniversary-edition timepiece, which is limited to just 1,962 pieces in honor of the year the watch and astronaut flew, includes a 24-hour display and manually winds, two features Breitling points to as nods to the watch that flew in space. The back of the watch features a Celsius to Fahrenheit conversion scale, another detail that is faithful to vintage Navitimer models. The caseback is also etched with a commemorative logo for the Aurora 7 mission. Click through to collectSPACE.com to see more photos of Breitling’s 50th anniversary Navitimer Cosmonaute and the original that astronaut Scott Carpenter wore in space.